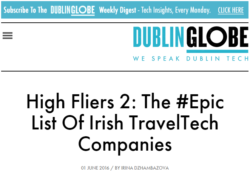 Published today in the Dublin Globe, the most complete list yet of companies doing travel technology in Ireland. The list is mostly Irish companies, but also includes some multi-nationals founded or based outside Ireland who have opened development or R&D centers here. Not all of the companies are exclusively travel focused (some fintech and data analytics), but they all have at least a significant travel division or travel industry customers. If you use Twitter you might find the following list of Twitter accounts useful: https://twitter.com/marklenahan/lists/travel-tech-in-ireland (view list members).